Ending weeks of speculation, Alaska Libertarian Party Senate nominee Frederick "David" Haase told RealClearPolitics on Monday that he would not allow Republican Sen. Lisa Murkowski to replace his name on the general election Senate ballot. "I will not be stepping down to allow Lisa Murkowski or anyone else to take my place as the Libertarian candidate for the U.S. Senate from Alaska," Haase said. Haase said that he made his final decision to remain on the ballot over the weekend, a few days after meeting face-to-face with Murkowski. "I met with Lisa Murkowski last week at the request of the chairman of the Alaskan Libertarian Party, [and] we had a pleasant visit," Haase said. 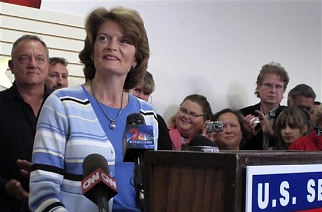 "Murkowski met with me at the request of some of her supporters." Haase said that he and Murkowski talked mostly about issues during their meeting, including his goal of reforming the Federal Reserve. Haase and Murkowski also chatted about her father Frank, Alaska's former governor whom Sarah Palin defeated in the 2006 Republican primary. "She made no request of me and she did not offer to change her position on anything," Haase said. Haase added that he admired and respected Murkowski but decided to stay on the ballot to defend his party's small government principles. "I'm sure there's people who think I was just stringing her along and just trying to get publicity," Haase said. "The libertarians got more publicity on this issue than anything else. It's out there all over the internet, so I guess I'm somewhat guilty of that. If I was to deny that, I wouldn't be very honest. It's not something I can say I'm proud of. I didn't set out to do that -- it just kind of came." As of Monday morning, the Murkowski campaign had still been holding out hope that Haase might allow the incumbent senator to take his place on the general election ballot. Murkowski's only remaining path forward to holding onto her Senate seat would be to run as a write-in candidate, an option which she is expected to announce a decision on this week. The challenge of running as a write-in candidate would be a daunting one, but Murkowski's campaign staff is ready to roll if she decides to try it. "It's going to be up to a lot of people not only to write it in themselves but to educate their friends and neighbors to do something like that," Murkowski campaign manager John Bitney told RealClearPolitics on Monday. "The fire in the belly has to come from a lot of people. It's going to take 3,000 people committed to each getting 25 people to do this." Bitney said that he did not know when Murkowski would make her decision about whether to mount a campaign that he says would have to be "very grassroots." In the general election, Murkowski would no longer enjoy the support of the National Republican Senatorial Committee, which is now backing Miller financially. Murkowski has been heartened, Bitney said, by strangers who have approached her on the street to encourage her to stay in the race -- something he says he witnessed firsthand on Saturday while he was having a conversation with her in Anchorage. "Two different times in the parking lot people just came up to her, shook her hand and asked her to stay in," Bitney said. "There's nothing in it for them other than they're talking to her from their heart. They're not an interest group. They're just everyday folks, and this is what they're saying." Bitney said that he and other members of Murkowski's campaign staff were continuing to research the legal questions involved in mounting a write-in campaign, should she decide to launch one against Miller and Democratic nominee Scott McAdams. "A lot of people are anxious to hear, and the clock's ticking," Bitney said.